Today many wonderful authors and super mystery fans are off to Malice today. I only recently learned about Malice, this conference sounds amazing. Offered to mystery lovers and authors alike this three day convention in Washington DC offers mystery fans the chance to get up close and personal with several of their favorite authors. As I see many of my favorite authors and fellow Facebook cozy mystery fans regularly on Facebook I want to wish them safe travels. I see many of them posting that they are heading to this annual spring event today and send my best wishes and hope that they will have a fantastic time. Living on the West Coast the cost of going to Malice is very high for me but perhaps I will have to save my loonies and put this conference on my bucket list! To learn more about Malice please click here. I can not wait to see the photos and hear the stories from this weekends event. If you happen to be heading to the conference, tell them all I say hello! With you in Spirit! Thank you for joining me for this quick cup of tea. So today is my birthday. 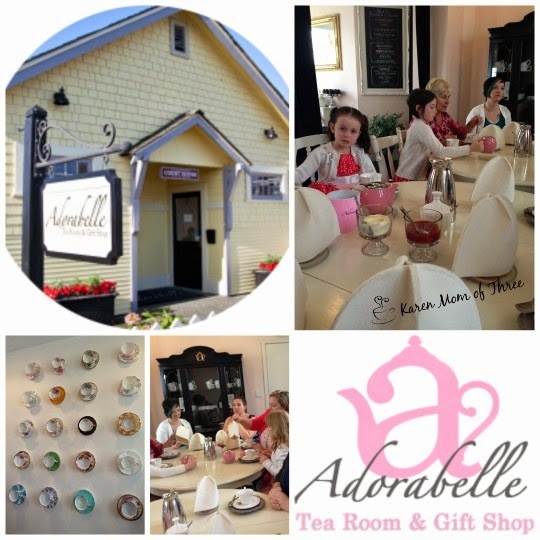 Last weekend my sister Stephanie surprised me with a surprise birthday tea party at the Adorabelle Tea Room and Gift Shop in Steveston BC. The tea room was once the 1925 Court House for the Village of Steveston. The tiny tea room is located about an hour from where I live and is one of the smallest tea rooms I have ever been in. 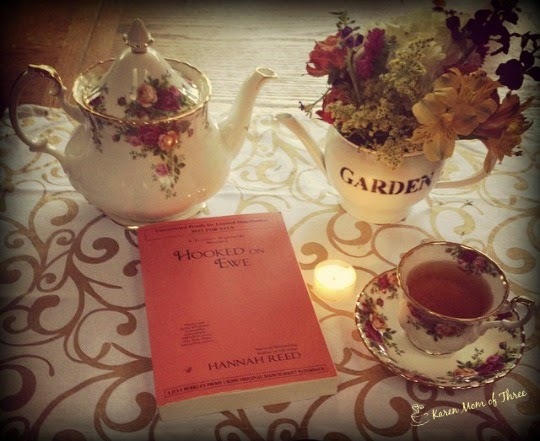 The menu was set for our party of 12 and this tea room can only seat 20 and has a strict 1 hour and 15 min turn over policy to accommodate those hoping to get in to experience for themselves this cozy little tea room. The sandwich layer had a lovely Waldorf Chicken Salad, The perfect egg sandwich and a salmon sandwich which my mother in law loved (I don't eat fish do to a shell fish allergy) Also on the bottom tray a savory muffin with bacon and chive cream and a cheddar and herb cracker that was made in house. The scones were delightful and the desert tray was enjoyable. The item that stood out most on the dessert layer was the Earl Grey Shortbread that was simply perfect. I had their Adorabelle Paris Tea which is a black tea with Currant, Bergamont and Caramel and I have had two pots of this tea every day since. I purchased three bags of 80grms of their tea for $25 while in their gift shop and see myself driving out there to purchase more shortly. I have to say this is in my top 5 favorite black teas ever. The tables were all painted a creamy white color and they matched the felt tea cozies that adorned everyone's pretty pink personal teapots. In their gift shop they have a lovely wall with mounted teacups and saucers, it was very stunning. The shop offered bags of their house tea selections, mugs, handmade tea items and soaps. The tea room and shop is open Wednesday through Sunday from 11-5 pm. To find out more or to book yourself in for tea please visit their website by clicking here. 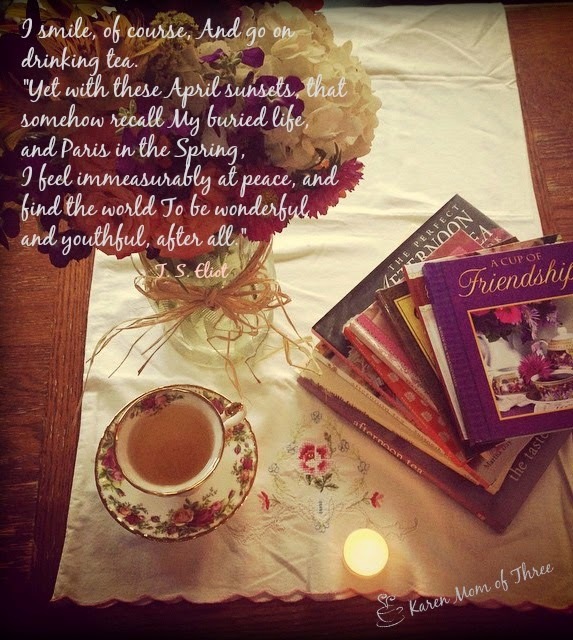 Once home from the tea party I actually made a pot of the Paris tea and set myself a pretty table setting featuring some of the lovely gifts my wonderful friends and family gave me. You can follow their Instagram account by clicking here. 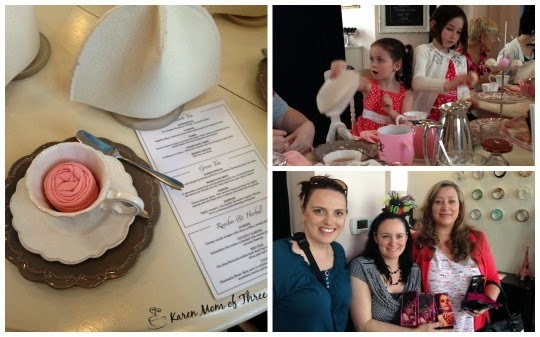 I had a wonderful time visiting this tea room and it was a great place to go with my young nieces as well they had a great kids tea menu and was the perfect location for our girls day out. I have had a very busy week this on my table and I am so thrilled that the mail man brought me an advanced reading copy of Hooked on Ewe by Hannah Reed. I loved her first book in this new series and I am doing a happy dance to get to read it 75 plus days early! 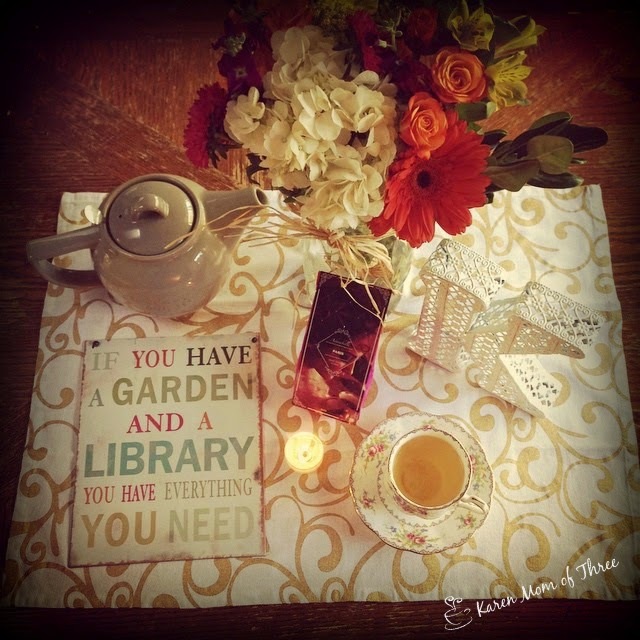 This is book along with the new Garden Tea Pot from my father are the gems on my table this week. It was also Mr. William Shakespeare's birthday and death day as I understand it this past week and I am amazed at the impact that his words and work still have today. 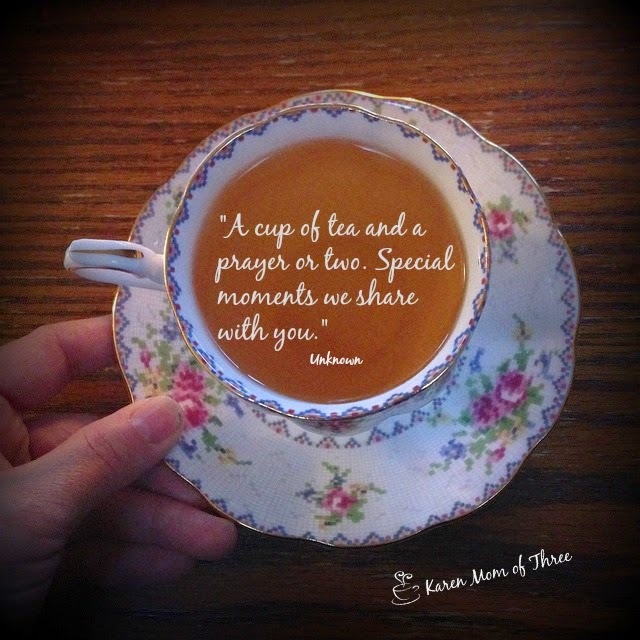 The above is my cup of tea and acknowledgment of the celebration of his life. 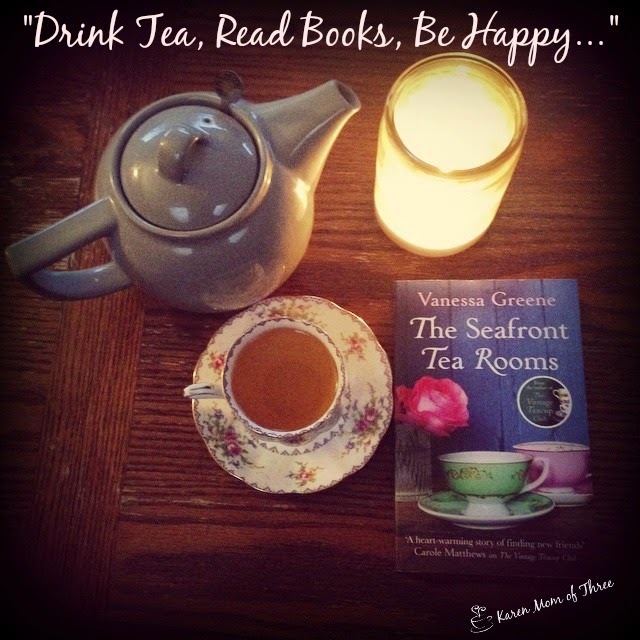 I ordered The Seafront Tea Rooms from The Book Depository recently and though not a cozy was drawn to the book by the cover and the title and I am looking forward to reading this one. I shall share that recipe with you one I find exactly what I was looking for. In my cup this week I found a heart. A young friend of mine named Ahmie who is 15 is battling cancer, I think about Ahmie, her mother and young sister and light a candle each morning. 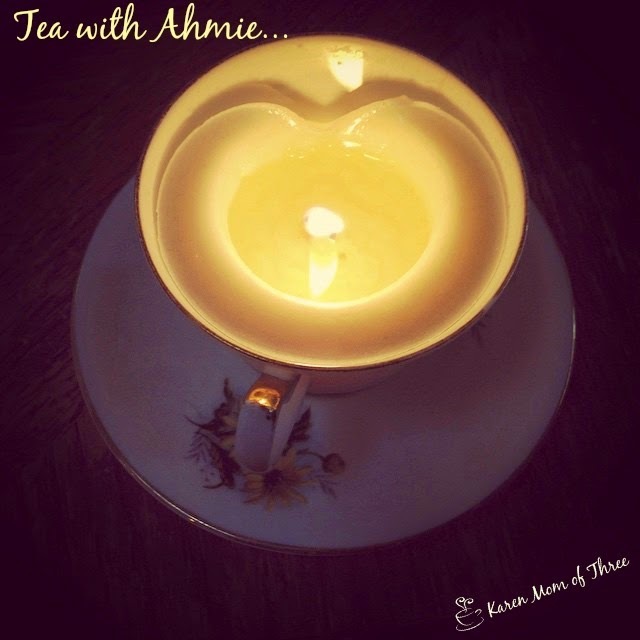 In their updates it is clear that Ahmie's hospice care is filling their days and through it all the family continues to live more in one day then most of us do in our life times. If you would like to learn more about Ahmie and her family please visit Operation Love For Ahmie by clicking here. 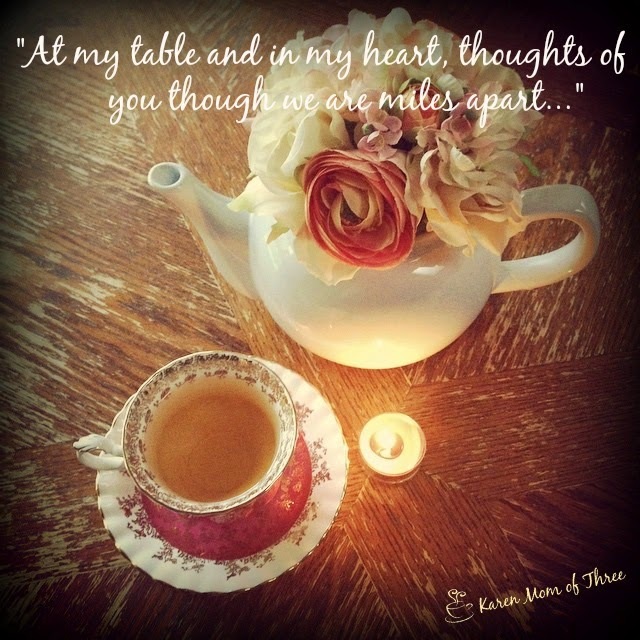 So do share with me what was on your table and in your cup this week? Great Book, Great Series! 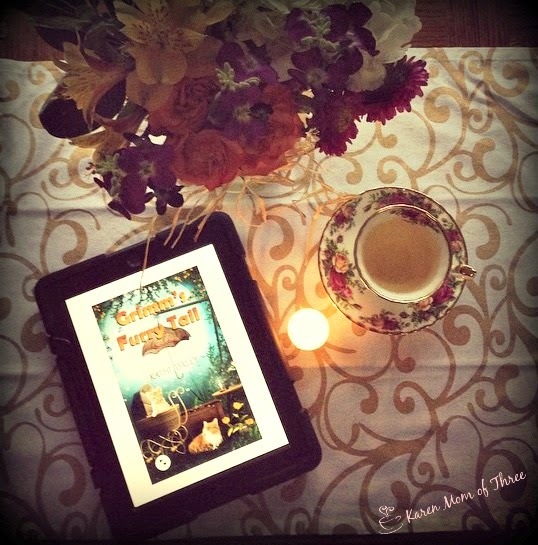 Grimm's Furry Tail by Kathi Daley The Third Book In The Whales and Tails Mystery Series. I finished Grimm's Furry Tail last night. Kathi Daley is one of my favorite Authors. I swear the woman must never sleep, every time I turn around and am looking for something to read she has another book coming in out in one of her fantastic series, all of which I read and enjoy. I loved the three books in this series for so many reasons. 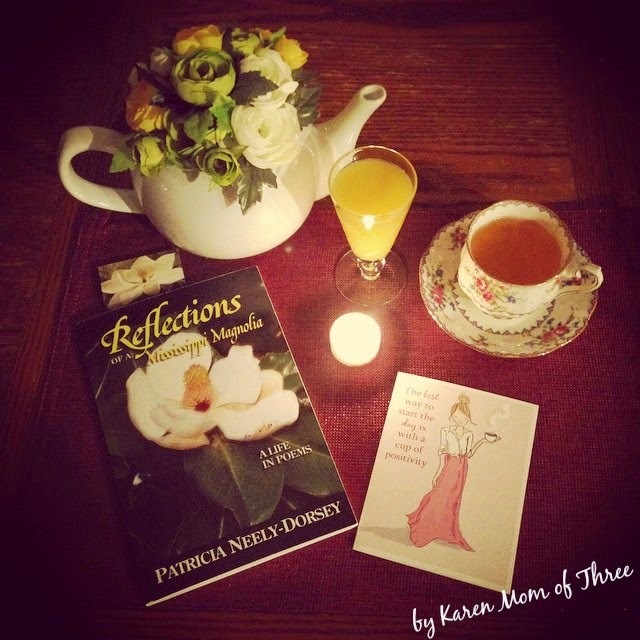 Kathi is great at providing her readers with intriguing story arcs as well as characters you can really get behind and support. Personally I loved this series because it happens so close to where I live here on the West Coast an there are not too many cozies set in the Pacific North West. 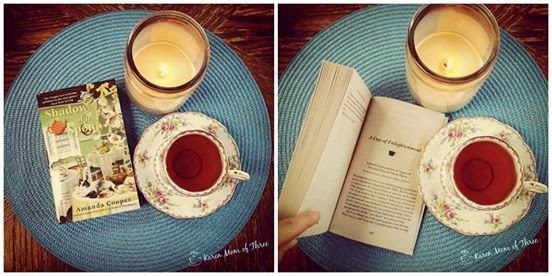 I also love the idea of a Cat/Book/Coffee sanctuary, long lost loves and friendships and families that stand the test of time, of hardship and of joy. 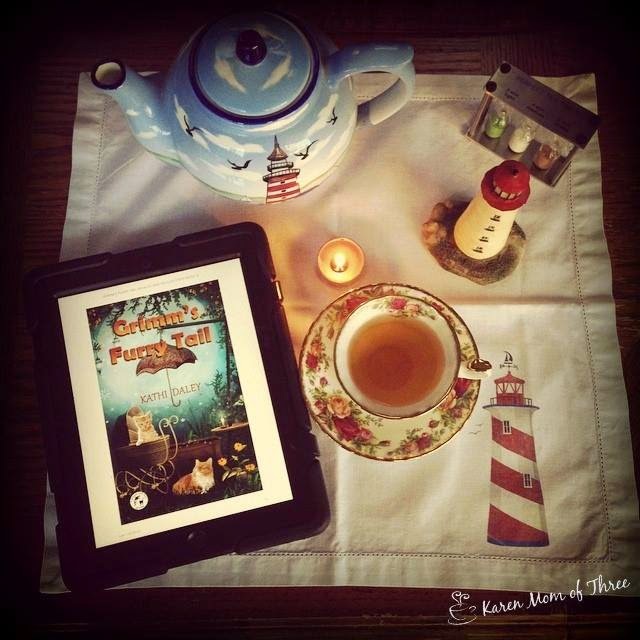 If you are looking for a warm and friendly series with a bit of murder mystery and fantastic characters check out Kathi Daley's Whales and Tails Series which is being sold as a box set on Amazon for your Kindle (or Ipad app like mine) for $2.99 Click here for more information. 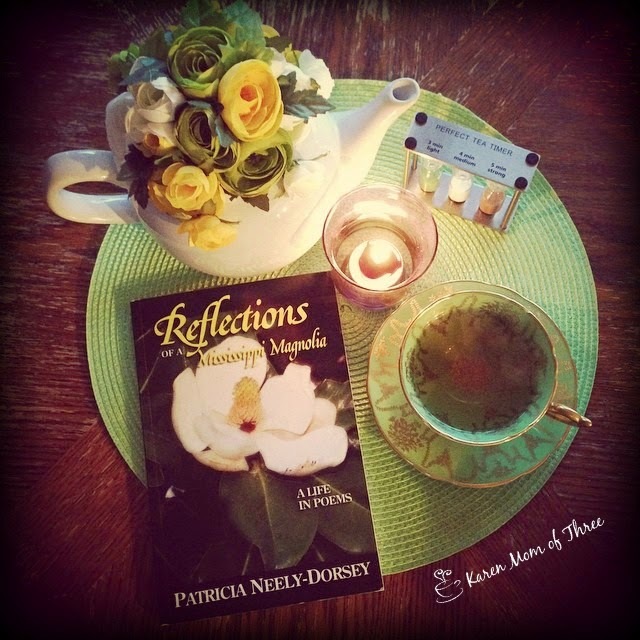 Thank you for joining me here for A Cup of Tea and A Cozy Mystery Review. 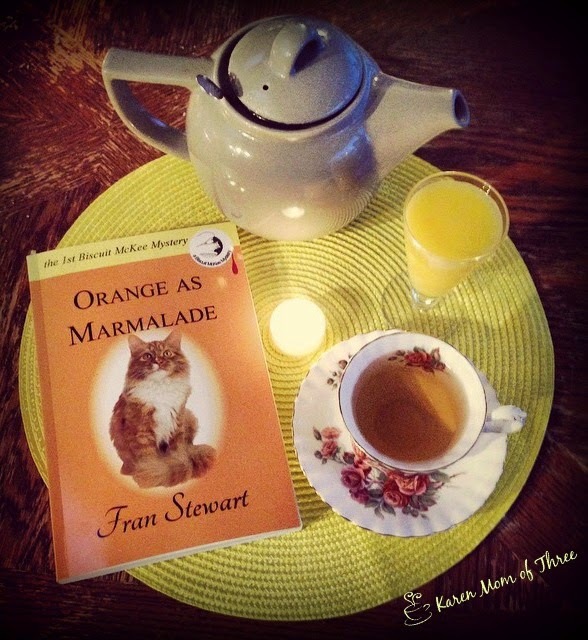 Author Fran Stewart kindly sent me a copy of Orange As Marmalade to read and review. I had not heard about this series and was thrilled when it arrived. 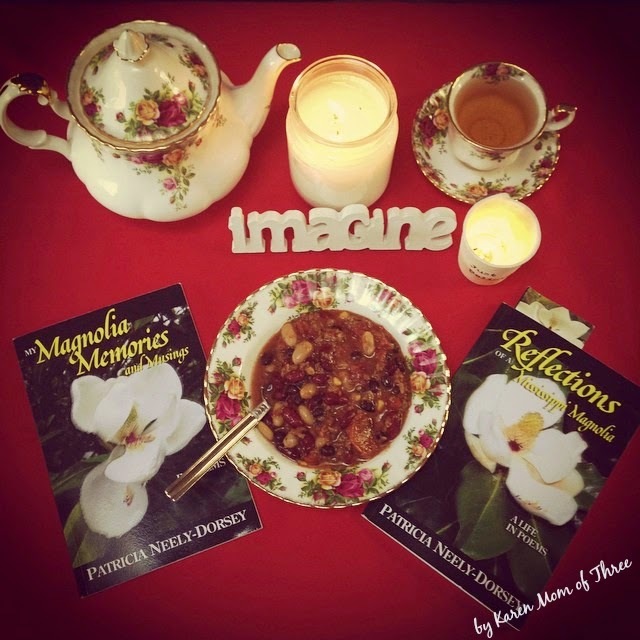 This is the 1st Biscuit McKee Mystery and I really enjoyed reading it. I also loved how it looked on my table! The pace and format of this story was different then any cozy I had read before. 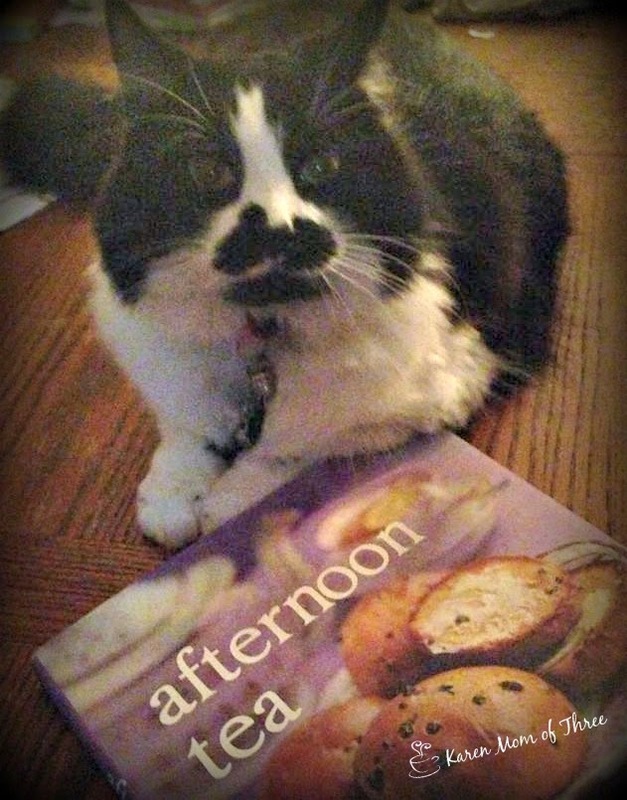 I loved getting to know Biscuit and her sister, through out this book as much as I liked getting to know Marmalade the cat. This story manages to cover two years at one time and yet is easy to follow. The story of how Biscuit meets and falls in love with Bob is sweet and perfect for a cozy mystery, where else do you expect the main characters meet and fall in love over the dead body of one of the small town residents. Any other love story would not have been so sweet and as awkward as this one. I enjoyed the way the love story unfolded as well as the mystery it's self. So much happens in the book that I did not guess how the story lines would intersect and was surprised with how the suspect was apprehended. 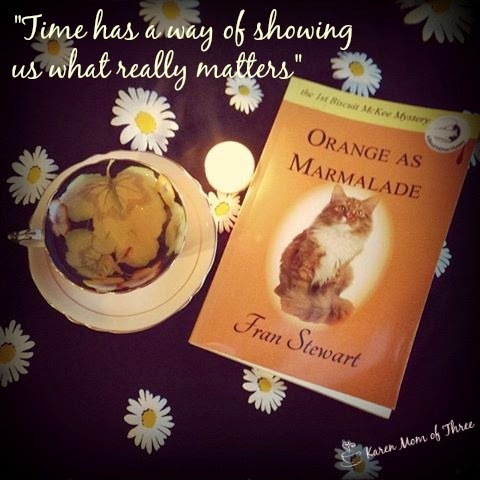 If you have not yet read Orange as Marmalade and you love a story about relationships and a very clever cat this is a series for you. To order a copy for yourself please click here. 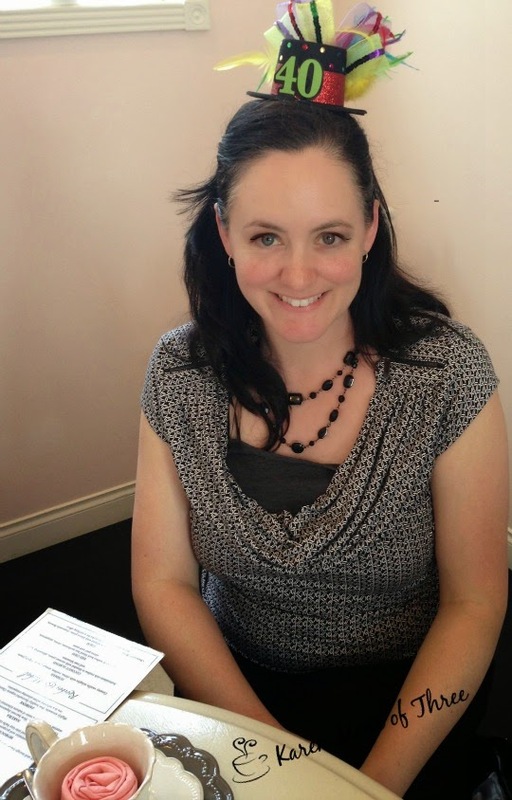 To learn more about Fran Stewart please click here. 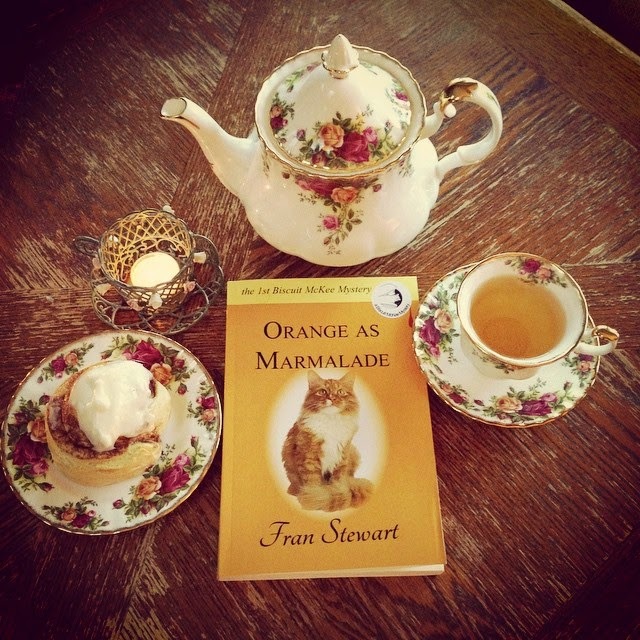 On my table this week I have had Fran Stewart's Orange As Marmalade. I am loving this book, I am half way through and loving it. The relationship between the sisters and the commentary from the cat makes for a lovely paring. 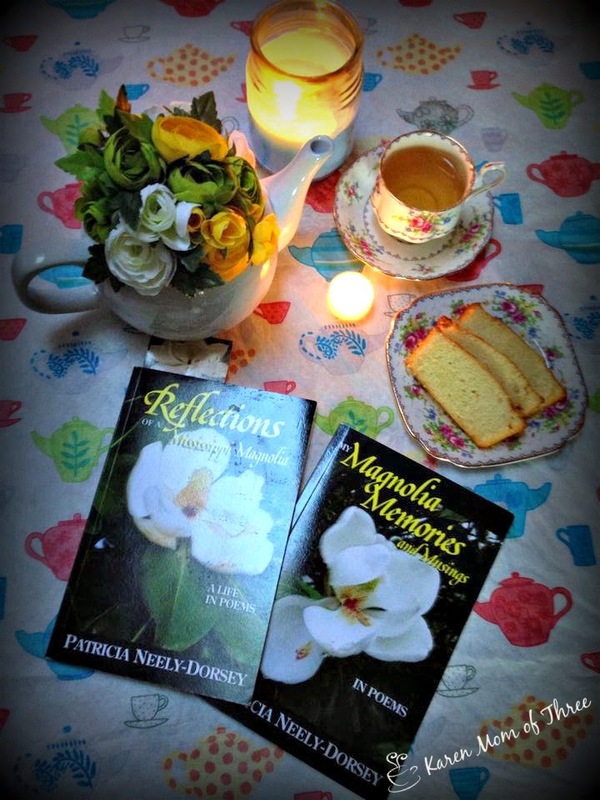 Find out how to order this touching cozy by clicking here. 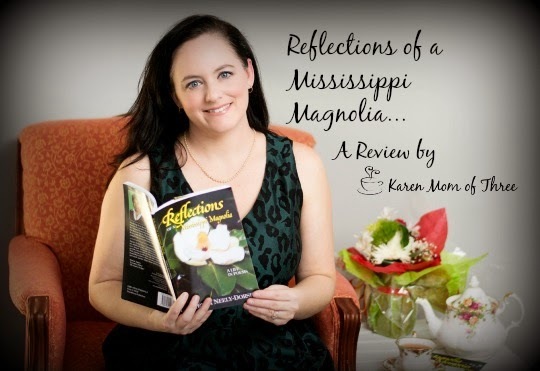 Also on my table this week is Reflections of a Mississippi Magnolia, not a cozy mystery but a cozy collection that will transport the reader to Mississippi and make you feel most welcome. Find out more about Patricia Neely-Dorsey's work by clicking here. 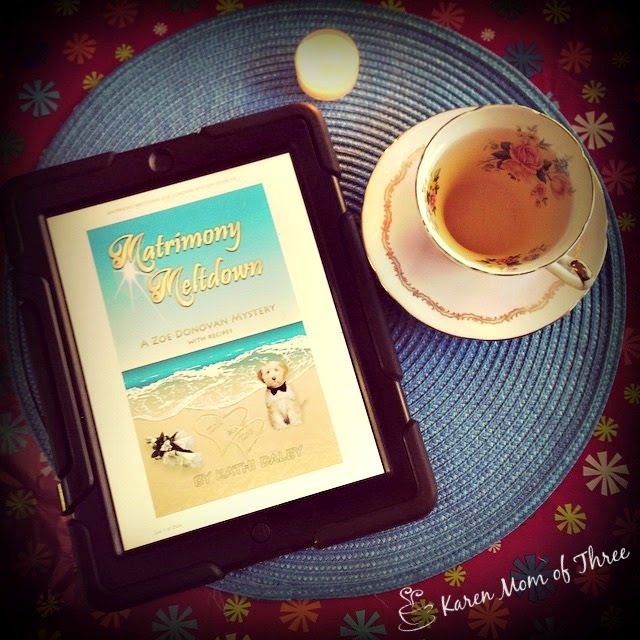 New on my table this morning is Kathi Daley's Matrimony Meltdown A Zoe Donovan Mystery I am looking forward to reading. You can down load it to your mobile reading device by clicking here. 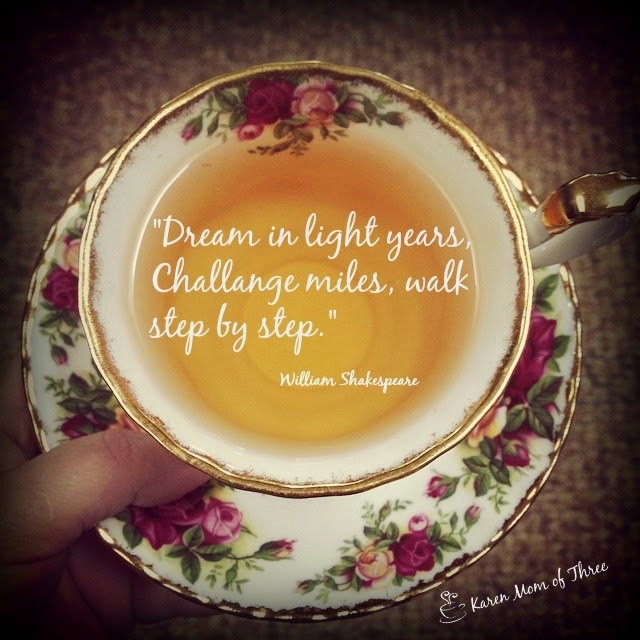 In my cup is my favorite stand by Earl Grey de la creme from Steeped Tea. 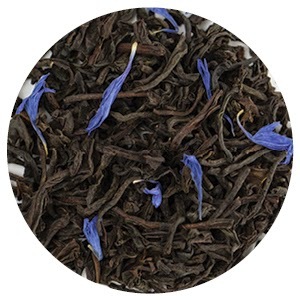 I have been enjoying this tea now for almost three years daily and it is a warm and wonderful Earl Grey with hints of a creamy caramel taste that I just love. 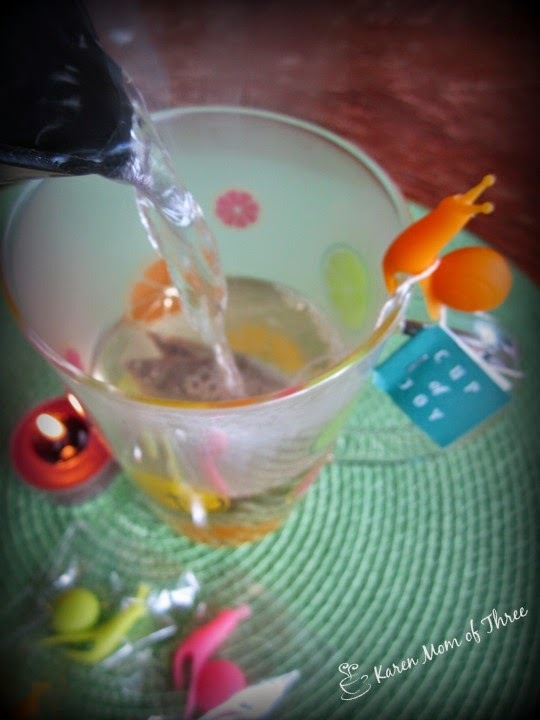 You can order Steeped Tea on line or at home parties and they have a great tea of the month club. Click here to find out more about this tea. 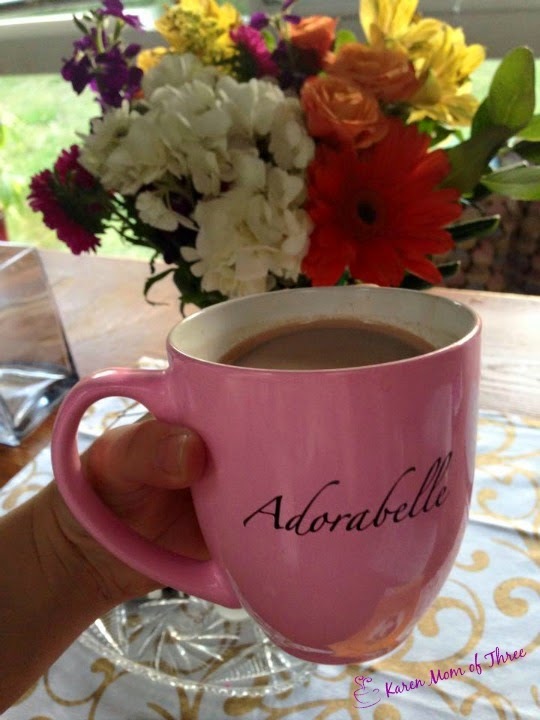 So what is on your tables and in your cups this week? 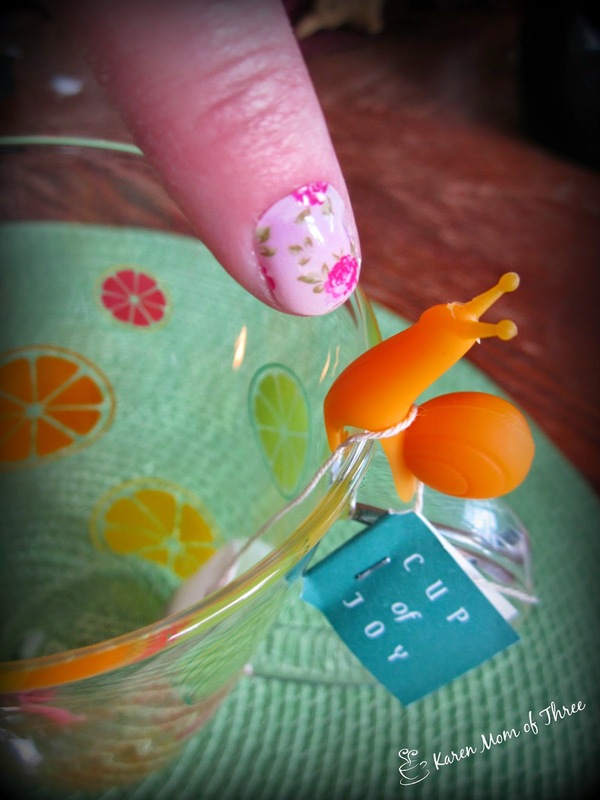 Tea Snails and A Cup of Tea, Yes This Is A Real Thing! I first heard about tea snails a few weeks ago and ordered them right away. 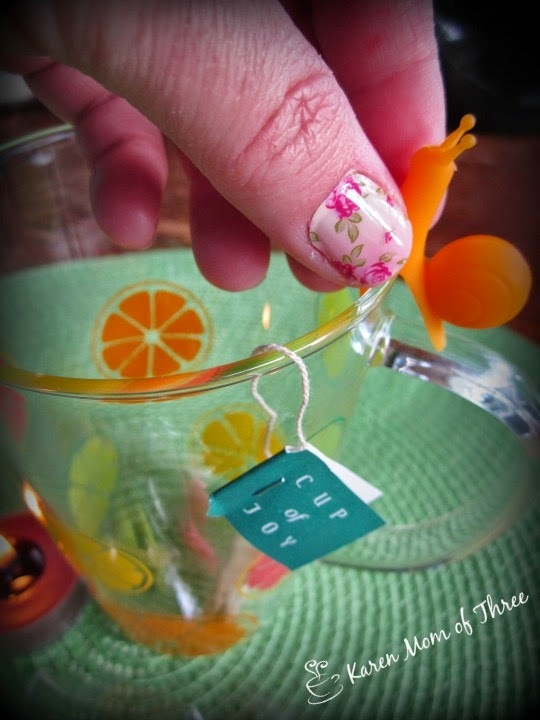 If you have never heard of the tea snail and you are a tea bag enthusiast this is the accessory for you! 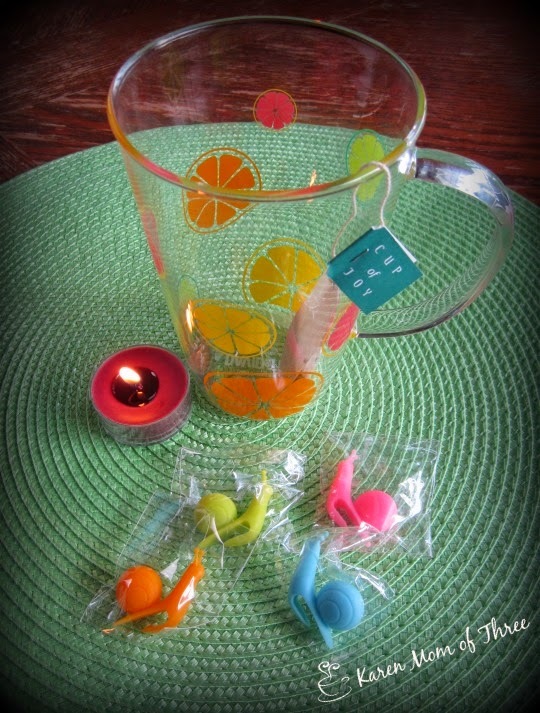 These little silicone tea pets fit along the rim of your favorite tea mug and you loop the string of your tea bag around their shell to stop it from slipping in your cup or worse, your tea steeping and dripping out of your mug via the strings of your tea bag. 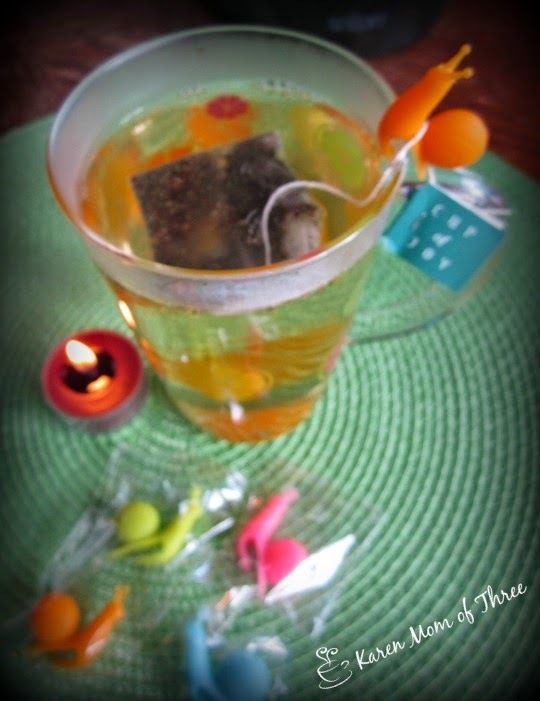 These are very easy to use and make great gifts for tea lovers! Perfect to slip into an envelope or birthday/holiday card and fun to use at the office. These little friendly helpers are very affordable I picked them up on Ebay for 20 cents each including shipping. I did have to wait a few weeks but these are totally worth it. 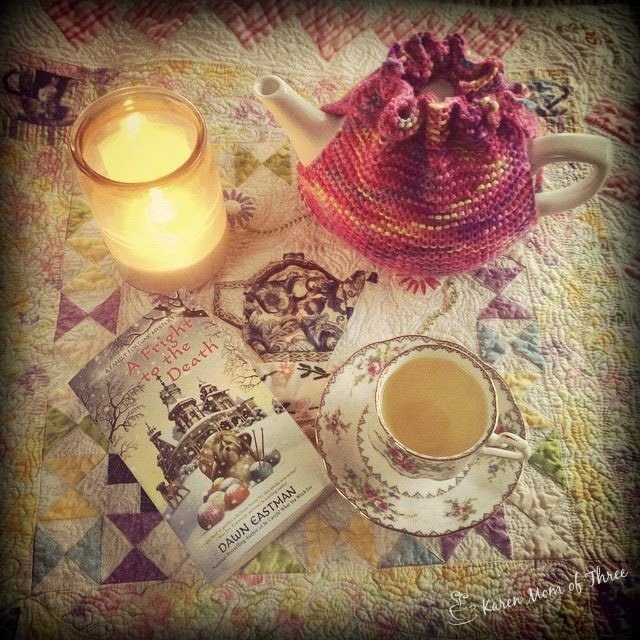 Click here for the Ebay shop I purchased the tea snails from. 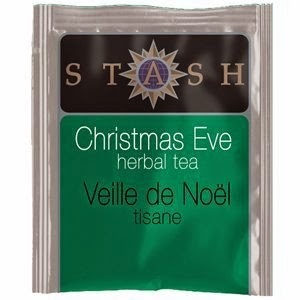 In case you may be wondering what teas is in my cup with the "Cup of Joy" tag, the tea bag is Stash Tea's Christmas Eve Herbal Tea which I hoard in November/December when it goes on sale. 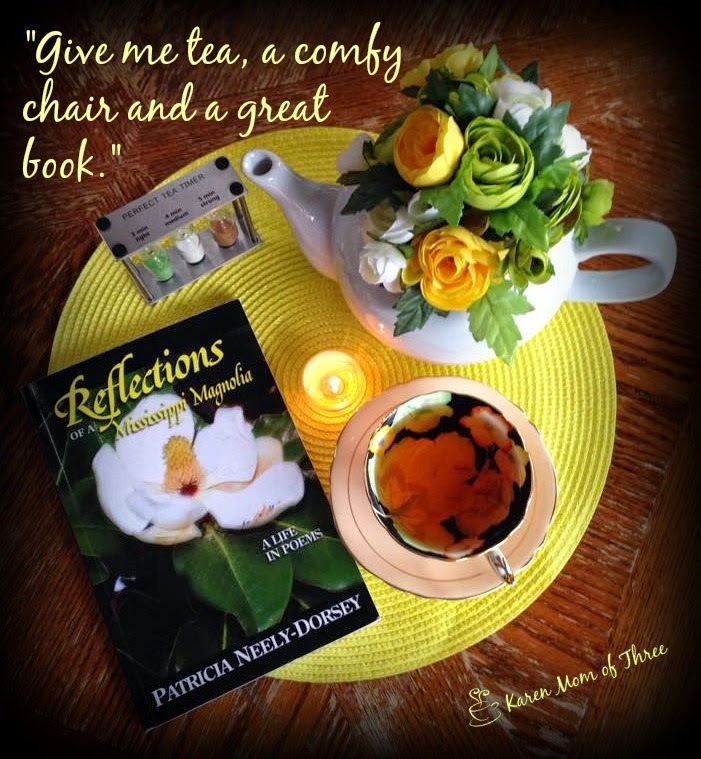 This tea is a "caffeine-free blend of mint and sweet spices, perfect for a moment of peaceful reflection". I drink it year round and really love the taste you can purchase it year round on the Stash Website in loose leaf or bag. Visit their website by clicking here. Thank you for joining me for A Cup of Tea. A friend of mine is a Jamberry Nail rep living in the USA. 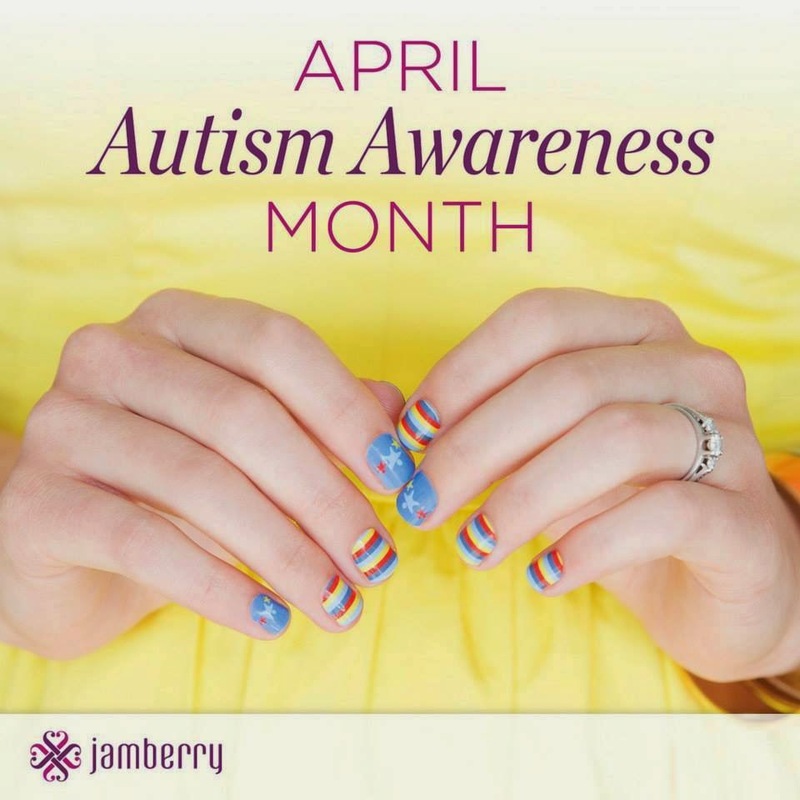 I had never heard of these nail wraps until I was setting up a fundraiser with another friend of mine to help families in the USA, like mine (though we live in Canada) who live with children with Autism. I am a mom of three boys as some of you may know and two of my boys have Autism. I belong to many groups who fund raise to help families like mine get access to therapy, equipment and life skills training through out the year but especially in April. Tonight through April 21st we are hosting a FACEBOOK event where 10% of each order will go to benefit families living with Autism access therapy tools, toys and equipment. While my family will not personally benefit from this fundraiser we know how much it means to families like ours to have the support of our on line community. You can join our Facebook Event by clicking here. 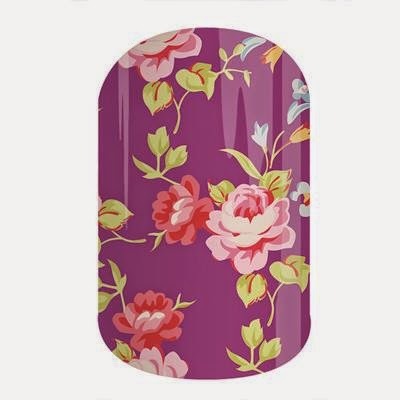 You may also see what Jamberry has to offer on the consultant's website and our event page by clicking here. Tonight was the first time I have ever done anything like this on my nails. 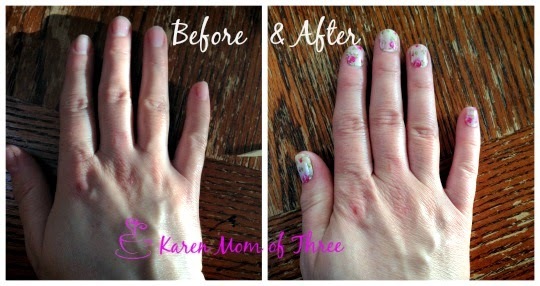 I was thrilled with how easily these nail wraps went on and how they look! I also love that they match my china! 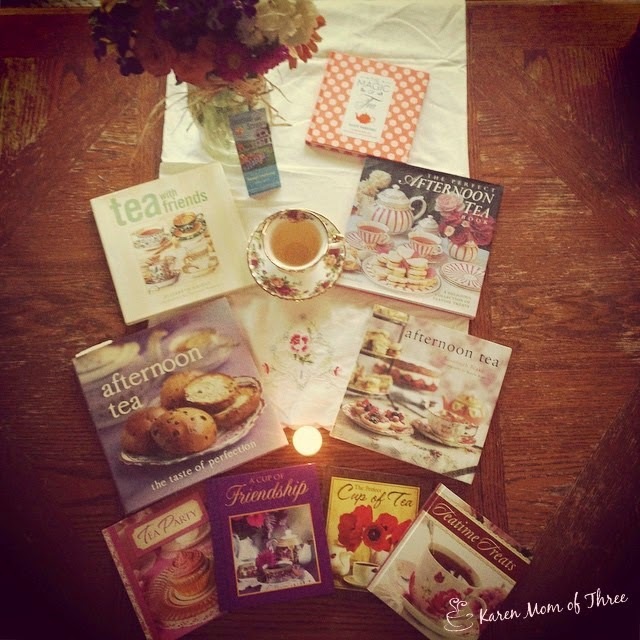 There are so many wonderful Tea themed and floral prints to choose from. Below are some of the ones I have added to my wish list and I am ordering for this fundraiser. This set is called Cup of Tea Click here to see it on the website. This one is called Tea Time Click here to see it on the website. 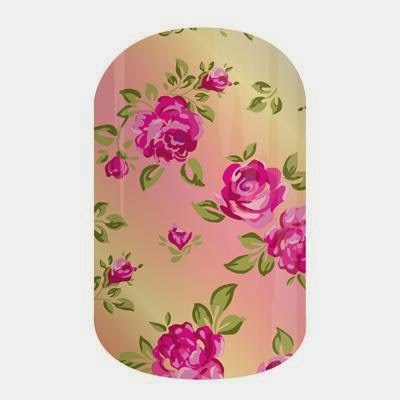 The nail wrap I am wearing and loving is called French Countryside and is a perfect match for my china pattern Old Country Roses. Click here to view it on the website. 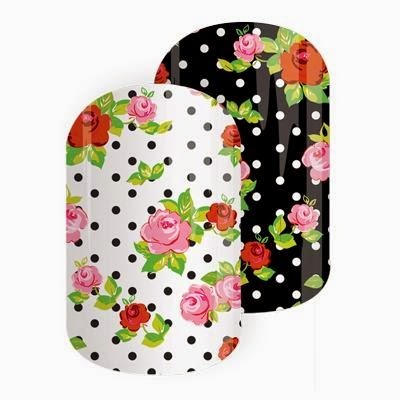 I am so thankful to my friend Sheryl for sharing with me her passion for nails and sending me this set of nail wraps to review in time for our fundraiser and I know I am hooked! 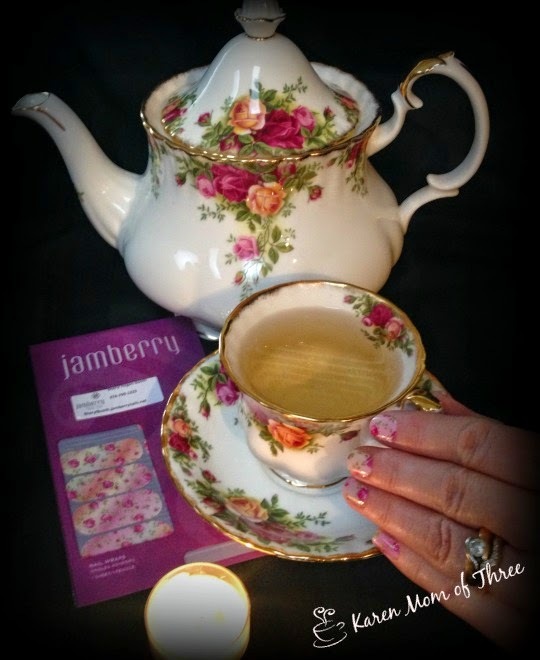 I can not wait to do my nails again and perfectly coordinated with my tea times! 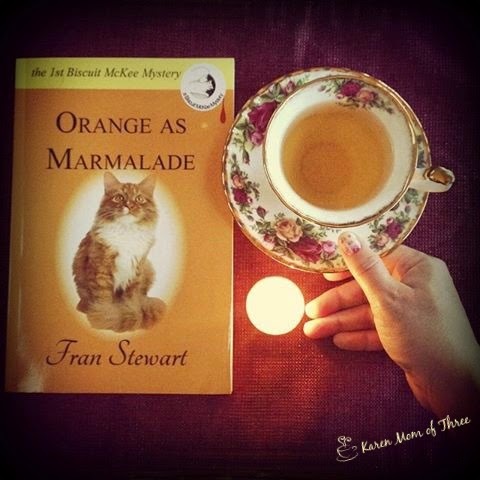 Thank you for joining me for a cup of tea and a cozy mystery today, I am off to continue reading Orange As Marmalade by Fran Stewart. 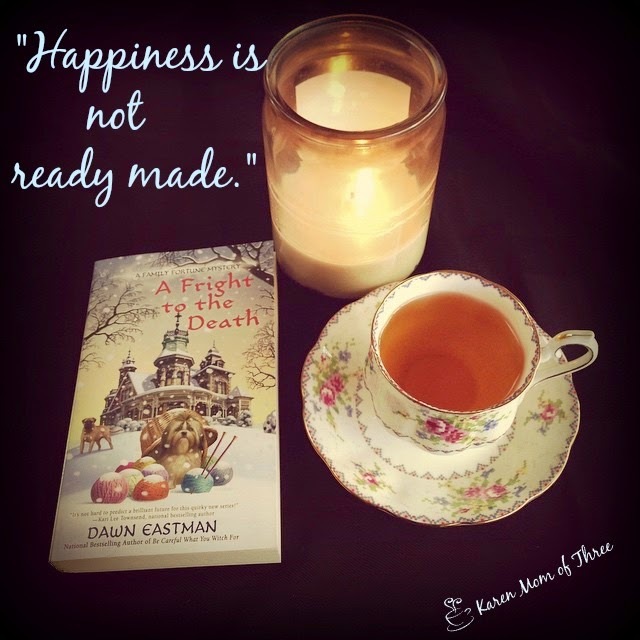 I finished a Fright To the Death by Dawn Eastman last night. This is the third book in the Family Fortune Mystery series and the best one thus far! Main character Clyde Fortune has her hands full in this story with her family and mysterious death that have now serendipitously found away to put the breaks on her romantic getaway with her boy friend Mac. Clyde and Mac find themselves stuck in a horrible winter storm and seeking shelter in what Mac hopes will be a Romantic Castle getaway, the two are disappointed to learn that the castle is full, of their own families who are away on a Knitting Retreat. While they wait for the blizzard to blow over, the sudden murder of one of the castle owners casts a shadow of a doubt over the knitters, owners and staff alike. Snowed in, no power, great food and great mystery this story has delightful characters, wonderful family interactions, a bit of supernatural mayhem and some truly wonderful pets. I highly recommend this series and really enjoyed this book. 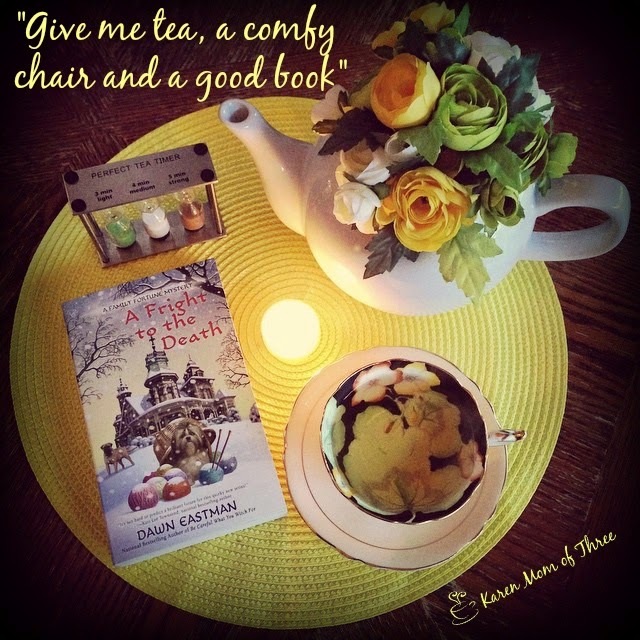 You can find and order your own copy of A Fright To The Death by clicking here. 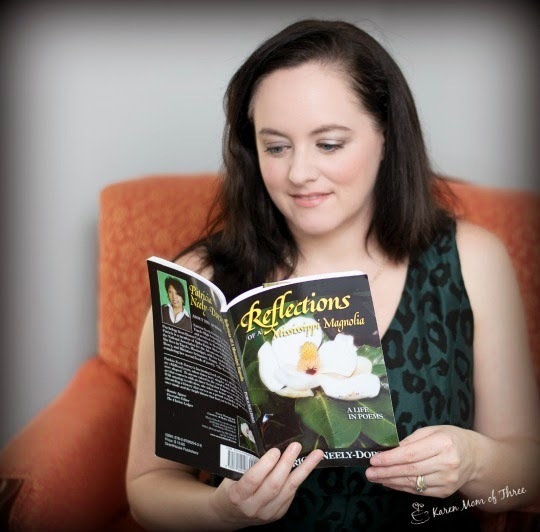 To learn more about Dawn Eastman please visit her website by clicking here. 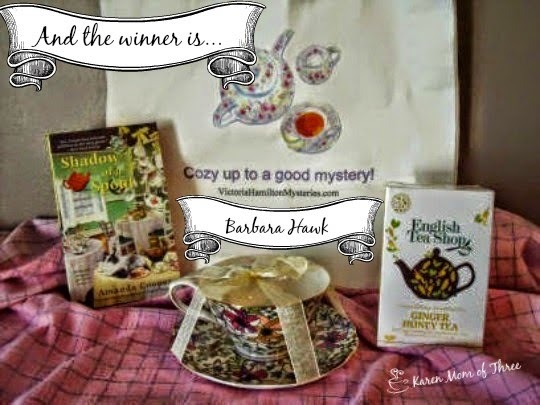 Thank you to Amanda Cooper for sponsoring this wonderful give away and congratulations to Barbara Hawk winner of the prize pack! Barbara has been contacted by email. Be sure to get your own copy of Shadow of A Spout and don't forget to read to the end! Click here to order your own copy and start your adventure today.